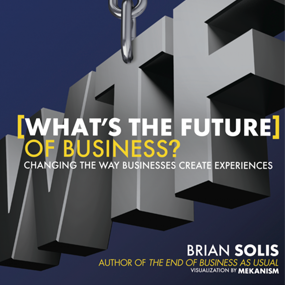 Solis explores the incredible transformation happening in business today, driven by new social and mobile technologies. In the future, successful businesses will be ‘Customer Companies’—companies that connect with their customers, partners, employees, and products in entirely new ways. If anyone understands the multi-screen world we’re becoming, it’s Brian Solis. Your customers and employees expect rich engagement on multiple screens, through dedicated experiences for each, with one integrated brand voice. Read this book. Businesses are falling into a mode of management which cultivates siloes and is causing them to lose market momentum. Businesses must always compete for the future, and this book shows what to do to stay ahead of your markets and avoid being disrupted by technology to the point that you go out of business. Customers are adopting new technology and new ‘screens’ at an increasingly rapid pace. The challenge for businesses is to create delightful and highly engaging experiences that take maximum advantage of those technologies and devices as they are introduced. Developing a social strategy based on trends might be fashionable, but it’s not sustainable. The consumer demands more. Brian shows you how to innovate or die. Pretty easy choice, no? The music business has been impacted more than any other media industry in the last decade, and we’re still in the midst of our transformation. You have to recognize that change is constant, and an ongoing evolution is the only option. This book encapsulates it perfectly: people are looking for meaningful experiences, and you can only create them by innovating, experimenting, and defying expectations.